They have been wearing bags over their heads, but hey — at least they were there. It was the worst of times. It was the worst of times. And it showed in the stands. It was, as Rovell called it, a noticeable drop, but not nearly as noticeable as you might think after all those 3rd quarter Twitpics of empty student section bleachers and galleries of dudes with bags over their heads. Even with lower numbers reported by both Auburn and Tennessee, which had a 4.9 percent decrease, the SEC “still had the highest per-game average attendance with 75,538.” And even with 3.7 percent fewer people knowing the correct Jordan-Hare Stadium time each Saturday, Auburn fans still managed to be ranked the nation’s most loyal. 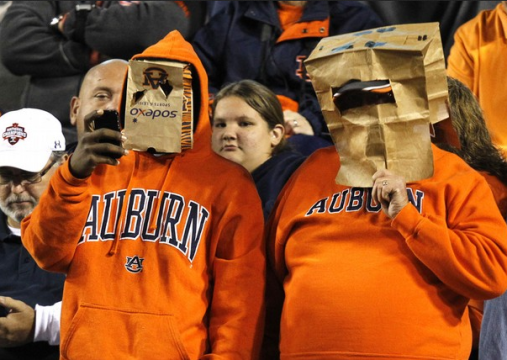 * Katherine Webb in an Auburn bikini? Since the university now requires mandatory parking passes on the Auburn campus for game day, the drop in attendance may be permanent.